All About San Miguel de Allende! If you are looking for a place to stay in San Miguel de Allende, our website has a wide variety of hotels, bed and breakfasts and vacation rentals to choose from. If you are planning a trip to San Miguel de Allende, be sure to check our tourist guide section, which has information on how to get to San Miguel de Allende, maps of San Miguel de Allende, a list of common Spanish phrases for travelers, and travel tips for visitors to Mexico, and other useful information that we've compiled. 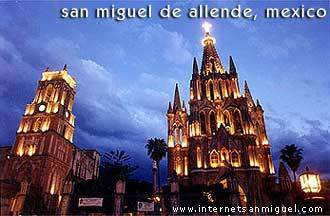 Why Come To San Miguel de Allende? Why is San Miguel de Allende one of Mexico's top rated destinations year after year? Perhaps it is because San Miguel's weather is nearly perfect year round. Perhaps it is because San Miguel de Allende's picturesque cobblestone streets and colonial architecture have inspired generations of artists. San Miguel de Allende also offers visitors and residents a vibrant and lively community of artists, musicians and writers and a delightful mix of Mexican folk traditions, fiestas and religious celebrations. Shopping in San Miguel de Allende is a shop-a-holic's dream - plenty of Mexican handicrafts, boutiques, art galleries, and furniture and home decor to choose from. How to travel to San Miguel de Allende? Most of the big airlines companies fly to San Miguel. Best way to get the most updated prices is to go the airlines sites and book through air canada customer service, american airlines customer service or united airlines customer service. But San Miguel de Allende isn't just for tourists -- The foreign community of San Miguel consists of thousands of people from all over the world who have chosen to make this delightful and historic town in Central Mexico their home. In the Real Insider's Guide to San Miguel section, you can read contributions from a variety of long time residents about their experiences living in Mexico and San Miguel de Allende, or submit your own stories and even ask questions about life in San Miguel, Mexico. If you are thinking of living in San Miguel de Allende part time, full time or even retiring in San Miguel de Allende, you are probably interested in our San Miguel de Allende real estate. Internet San Miguel has a wide selection of houses for sale and properties to choose from, as well as real estate agents and businesses for sale. Also please subscribe to our free All About San Miguel, Mexico Newsletter, the twice monthly review of upcoming events, news, and community profiles - of interest to both tourists and residents of San Miguel Allende. Remember that it could get very hot here and it's always good to have a good hotel room here. Especially if you have hyperhidrosis. We also recommend the threatment of iontophoresis for this.